A fresh Honda nameplate on an all-new subcompact crossover. 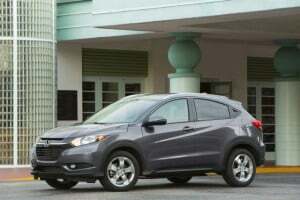 Based on the automaker’s pacesetting Fit hatchback, HR-V joins the burgeoning mini-SUV class to compete with the Chevrolet Trax, Jeep Renegade, Mazda CX-3 and others for young families, youthful urbanites, and empty nesters. 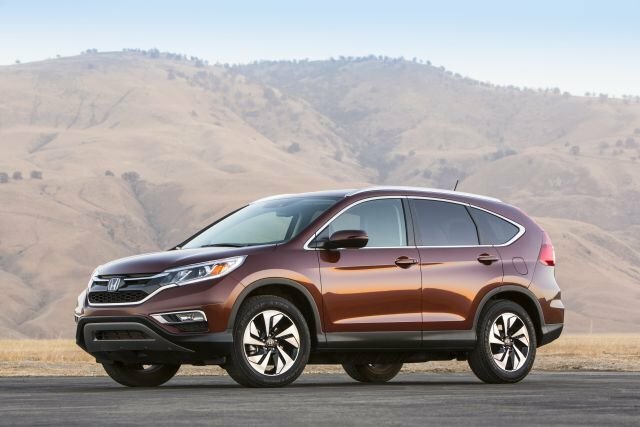 A four-door five-seater available with front- or all-wheel drive, its lower body echoes the look of Honda’s larger CR-V and Pilot crossovers but its roofline is tapered to suggest the stylishness of a coupe. HR-V – Honda says the name has no specific meaning — is 8.1-inches longer and 3.2-inches taller than the Fit and uses similarly clever packaging to create a voluminous passenger compartment and class-trumping cargo versatility. 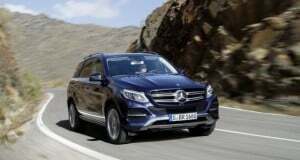 The automaker considers it the gateway to its crossover lineup, slotting beneath the larger, compact-class CR-V — America’s best-selling SUV — and well below the midsize Pilot. The $19,995-$26,720 price range is within a few hundred dollars of similarly equipped rivals, though don’t expect discounts through the first year or so of sales. Indeed, if Honda’s stinginess with the CR-V is an indication, you’ll be paying close to sticker for some time to come. Instead of offering stand-alone options, Honda packages each model with an ascending range of features and set its price accordingly. This three-tier lineup starts with the LX at $19,995 with front-wheel drive and a 6-speed manual transmission. (All “base” prices include Honda’s $880 destination fee). 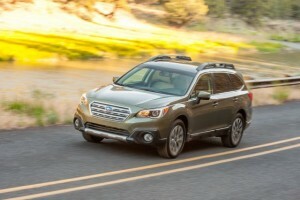 Add $800 for the continuously variable transmission (CVT) this crossover uses instead of a conventional automatic. All-wheel drive (AWD) is available only with the CVT and brings the price of an LX to $22,045. Most buyers will gravitate to the EX model. With front-drive, it’s priced at $22,045 with manual transmission and $22,845 with the CVT. The EX AWD is priced at $24,095. The top-line EX-L Navi version has leather upholstery and a navigation system, comes only with the CVT, and is priced at $25,470 with front-drive and $26,720 with AWD. That range averages 22 percent higher than the 2015 Fit, which starts at $16,315, and 21 percent lower than ’15 CR-V, priced from $24,325. Among 2015 competitors, Trax has a base-price range of $20,005-$27,405 and Renagade $18,990-$27,790, but you can add options to take them higher. 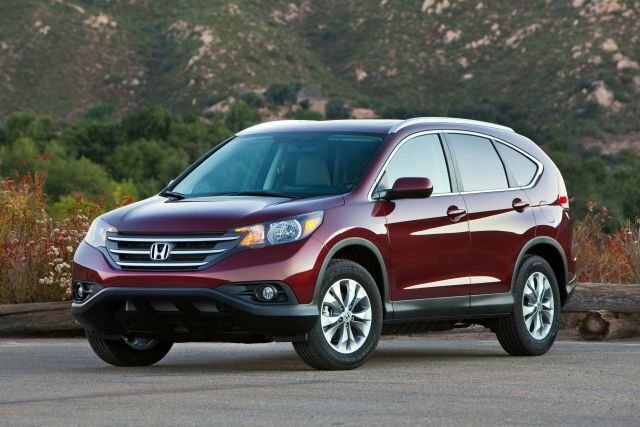 As for deals, the scarcity of factory incentives or deep dealer discounts on CR-V should hold for the HR-V. Pricing service TrueCar.com says average transaction prices trend between 0.7 percent and 3.6 percent below suggested retail for the CR-V (and just 1 percent below for the Fit). Always conservative with cash-back and cut-rate financing, Honda was offering few incentives on any of its vehicles as of Spring ’15, and none on the Fit or CR-V.
Look for a full redesign in model-year 2021. There’ll be a freshening before that, probably for model-year 2017. If sales are strong, the midcycle update would likely be routine — mild styling revisions to nose and tail, perhaps a new feature or two. But Honda has demonstrated a willingness to make emergency revisions. If HR-V sales lag, it could give it substantive sheet metal updates and add notable equipment, such as crash-mitigating automatic braking — and it could do it earlier than the scheduled midcycle update. The EX presents a fine balance of features and value, though to get some desirable amenities such as leather upholstery, an embedded navigation system, and satellite radio, you’ll need an EX-L.
Every model comes with power windows, locks, and mirrors and 17-inch alloy wheels. Cruise control and Bluetooth connectivity also are standard, as is a tilt/telescope steering wheel with thumb buttons to control them. Also aboard is a backup camera with normal, wide, and overhead views. It projects on the 5-inch dashboard screen in the LX and on the 7-inch screen in the EX and EX-L; the larger screen features moving backup guidelines. You can link the EX’s screen with your smartphone to display map apps. That’s useful, if less comprehensive than the EX-L’s full voice-activated, GPS navigation capability. In addition, EX and EX-L have a power moonroof, pushbutton ignition, fog lamps, heated front seats, heated mirrors with integrated turn signals, deeper-tinted rear side glass, and variable instead of two-speed intermittent windshield wipers. They also come with Honda’s Lanewatch camera that displays on the dash screen a view of your right-side blind spot when you activate the turn-signal lever or a button on its tip. There’s just one, a 1.8-liter four-cylinder, and it’s a fair performer in this light-for-the-class 2,888-3109-pound wagon. Most rivals beat its 141 horsepower and 127 pound-feet of torque. But linked to the smooth-shifting manual transmission — and unburdened of nearly 200 pounds of CVT/AWD hardware — it makes for a lively little conveyance. Mated to the CVT, it’ll still move you through traffic and onto freeways with minimal stress. But doing so with any verve demands liberal throttle application, and doing that triggers the old CVT bugaboo: high-rpm engine drone until your desired speed is achieved. At least it’s less intrusive here than in CVT-equipped Fits and Civics and more muffled than in compact crossovers like the Nissan Rogue, too. You can harness more torque for extra response or engine braking by getting the manual. Or you can slip the CVT’s console shift lever from Drive to Sport mode and, on EX and EX-L, work steering-wheel paddles to simulate seven ratios in what’s essentially a gearless transmission. The only subcompact crossovers with any real off-road cred are Jeep’s Renegade and Subaru’s XV Crosstrek. So with 6.7 inches of ground clearance – about an inch more than a car’s — and absence of a locking mode, an AWD HR-V’s prime directive is to get you moving on snowy pavement, though the system is calibrated to provide a smidgen of extra handling grip on dry roads. It’s worth it for added peace of mind, and just might encourage you to explore that gravel trail. With several key rivals still in development, any ranking within the competitive set is premature. But impressive EPA ratings suggest HR-V will be one of this nascent category’s higher-mileage members. With manual transmission it rates 28 mpg city/highway combined. 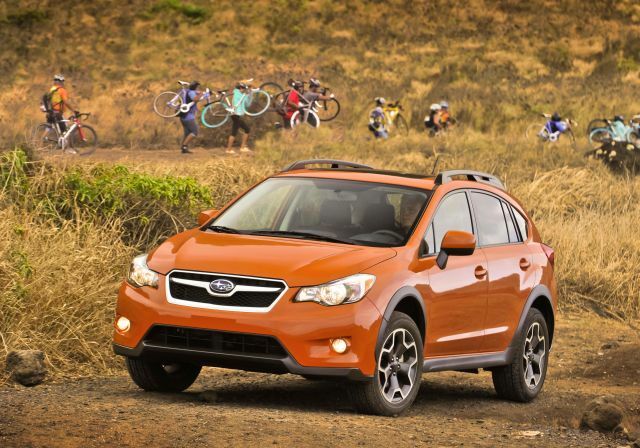 With the CVT, ratings are 31 mpg combined with front-wheel drive, 29 with AWD. The CVT comes with an “Econ” dashboard button to dial back the powertrain for further efficiency. By comparison, combined city/highway ratings for Trax are 29 mpg with front-drive and 27 with AWD. 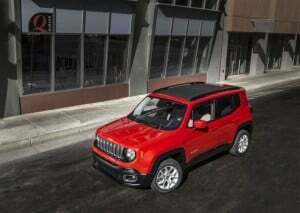 For the 160-horsepower, manual-transmission version of the Renegade, they’re 27 mpg with both front- and all-wheel drive, and for the 180-horse 9-speed-automatic Jeep they’re 25 and 24 mpg, respectively. Leading the class so far is the AWD Crosstrek Hybrid; it rates 31 mpg combined, but starts at $26,845. 7. 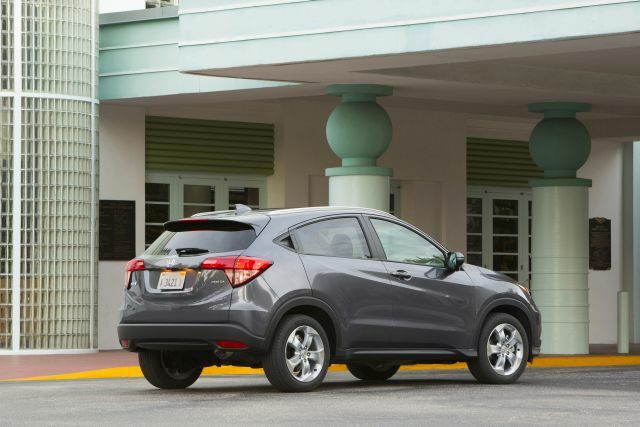 How does the HR-V handle? Pretty great, providing you don’t pretend it’s a sports sedan. 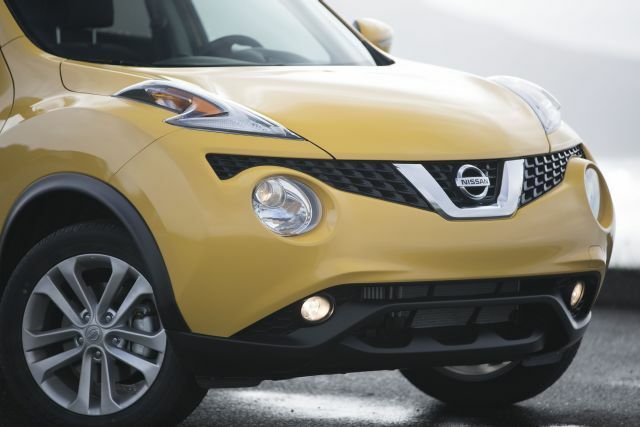 The Nissan Juke NISMO and John Cooper Works All4 editions of the Mini Cooper Countryman and Paceman are the dedicated performance models in this class. The Renegade invites playful driving, and Mazda’s reputation for sharp handling holds promise for the CX-3. But Honda’s ability to challenge any manufacturer for all-around road manners is evident in HR-V’s precise steering and nimble moves. As is the norm in this class, it lacks the sophistication of an independent rear suspension. But it’s reassuringly stable at highway speeds and fun on twisty roads, succumbing to noseplow only in very tight turns taken at very brisk speed. Depends on your approach to tension between fashion and function. Honda says its goal was an “aspirational” cabin with the attributes of a sporty coupe. So it cants the dashboard’s central control stack toward the driver and separates the front seats with a prominent center console. The effect is striking. The console’s gentle wave shape is truly elegant. Its tiny electric-parking-brake flipper – borrowed from the automaker’s upscale Acura division and debuting here at Honda — is a chic touch. So is a trim mix of delicate brightwork and trendy piano-black plastic. Simplicity rules in the LX. Its 160-watt, four-speaker audio system uses traditional volume and station-selector knobs and conventional search and present buttons. Its climate controls are similarly straightforward dials and buttons, generously sized and clearly marked. Fashion takes precedence over buttons and knobs in the EX and EX-L. You control their 180-watt, six-speaker audio system by tapping, swiping, and scrolling through icons on the 7-inch dashboard display. Their climate system is automatic (though not dual-zone) and relies exclusively on touchscreen interaction with a dozen or so icons. Granted, some audio functions can be governed via steering-wheel controls, but the screen-centric setups in the EX and EX-L demand a degree of attention and hand-eye coordination that’s less than optimal in traffic. And with activation possible solely through your fingers, the risk of unsightly scratching and scoring over the years is real. The front seats furnish fine lateral bolstering but may prove a bit narrow for the broad of beam. “Theater seating” slightly elevates a rear bench that’s supportive, features a reclining seatback, and is wide enough for two adults and a child. Lack of a fold-down center armrest is a demerit, though. Designers aimed for high-end contact points in an entry-level vehicle and hit their target. Numerous softly padded interior surfaces are accented with attractive simulated stitching. Particularly inviting is the EX-L with its upscale leather and color-contrasting door and dash panels. LX and EX cabins, relegated to single-tone gray or black, look dour by comparison. Ride quality is typical Honda: firm enough to register most bumps but sufficiently compliant to absorb them without harshness. Other than that CVT-influenced engine drone, noise levels are never bothersome. Using the same innovative space-maximizing packaging as the Fit means cargo room is a selling point. HR-V’s 24.3 cubic feet behind the rear seat and 58.8 with it folded beats any rival for which specs are available. This is near class-larger, compact-crossover volume. Icing the cake is Honda’s versatile “Magic Seat,” a split rear bench that and folds forward and can hinge rearward to accommodate objects surfboard-long, mountain-bike-tall, and end-table-wide. 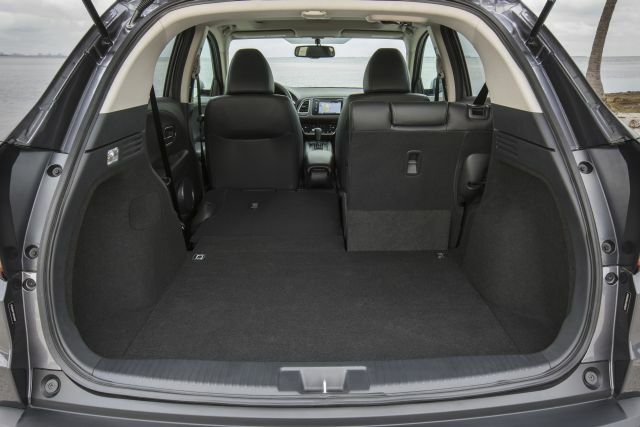 The hatch opening is large and the load floor low, but the folded rear seatbacks rest at a slight angle and small-items storage suffers from undersized console bins and door pockets shaped for beverages. Crash-test data is pending but Honda says HR-V was engineered explicitly to achieve top marks from the two most influential evaluating bodies. 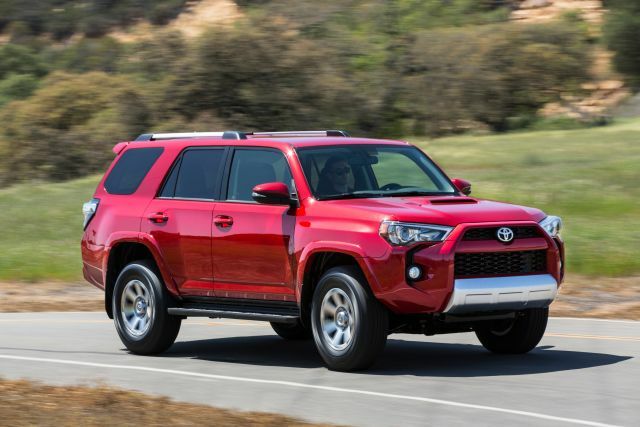 It’s designed to earn the maximum five stars for overall occupant protection under the government’s 5-Star Safety Rating system and win a Top Safety Pick designation from the insurance-industry-sponsored Insurance Institute for Highway Safety (IIHS). To achieve the IIHS’s coveted Top Safety Pick+ status a vehicle must offer front-crash-mitigating automatic braking. Versions of the CR-V with that feature are Top Safety Pick+ winners, but Honda’s newest crossover doesn’t offer that technology. However, unlike in the CR-V, where the most advanced safety features are exclusive to the top-line Touring model, every HR-V shares the same suite of airbags and anti-skid systems. Unfortunately, only HR-Vs sold in Canada are available with forward-collision and lane-departure warning. No telling until it establishes a track record but dependability and residual value are traditional brand strengths. Consumer-research firm J.D. Power ranks Honda an impressive fifth of 31 automotive brands for dependability. The HR-V, however, may need to overcome some early production glitches to live up to that high standard. It’s built alongside Fit in a new Honda plant in Mexico and introduction of both vehicles was delayed for months while the carmaker worked out problems with build quality. As for resale, expect strong residuals similar to those of the Fit and CR-V, which rank near the top of their respective classes, retaining 45 percent of their original price after five years, according to value tracker ALG. With this class still taking shape a hierarchy has yet to emerge. Honda isn’t immune to missteps; see the recently discontinued Crosstour crossover. But the HR-V looks like a winner. It’s stylish inside and out, exceedingly roomy, and priced right. It’s pleasant to drive, fuel-efficient, and carries the promise of reliability and resale value that are Honda brand assets. It delivers all it promises, and then some. Interestingly, Honda dares use the M-word to describe it. The automaker says the HR-V fuses the personal values of a coupe with the rationality of a minivan. It projects 70,000 sales annually. That’s just one-fifth CR-V volume, but an estimated 50 percent of buyers stepping through this gateway will be new to the brand. And once the Japanese automaker gets them, it tends to keep them. Honda claims nearly 63-percent owner retention, highest brand loyalty in the industry. 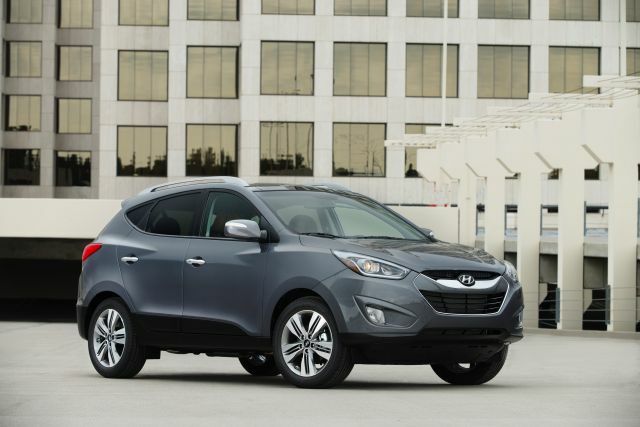 Will Updated Looks Be Enough To Keep the Hyundai Tucson Competitive in 2016?